The threat of Nazi occupation throws a fence up around this story of Jewish Warsaw in the Thirties, locking it into patterns of blind dailyness and a sweet, enduring, ultimately fatal foolishness: "so long as Hitler didn't attack, so long as no revolution or pogrom erupted, each day was a gift from God." Singer's familiarly autobiographical writer-protagonist here is named Aaron Greidinger, born Hasidic but rapidly secularized into Warsaw Yiddish literary life and a youth of abundant womanizing. His two main amours are absolutely polar. Betty Slonim, an American actress who's trying to triumph on the Yiddish stage with the backing of her rich sugardaddy Sam Dreiman, can offer Aaron a chance to be famous, to write a play for her, and, best of all, a way out of Poland before the Holocaust comes sweeping down upon them all. But Shosha, Aaron's childhood ghetto friend--a barely matured, runty girl who can't read or write and hardly knows how to even shop in the market--is Aaron's perverse choice. Shosha has a demon who tells her "that God is a chimney sweep, and that when we marry I will wet the bed. He butted me with his horns." She asks simple (and simple-minded) questions about the dead, about sin, about retribution. 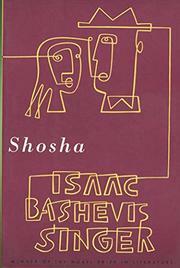 Since no one else is asking these utterly apt questions--neither the religious nor the literary folks--Shosha is a sort of feeble prophetess; the Warsaw sophisticates look on Hitler as proof of the Messiah's imminent arrival--they believe that things are so bad that they have to get dramatically, redeemingly better. We know they didn't, and Singer knows it, which is maybe why the book seems a little quilty, episodic, short-storyish; history does the bulk of the fictional work here, being the bully, the plot, the denouement. Shosha herself comes off unclearly, unparticularized, as are the rest of the characters except for Aaron/Singer. We miss the vividness, the claustrophobia of superior Singer; indubitably, upsettingly true, the story seems capped--and handicapped--with Destiny.